We made some rather disturbing discoveries along the way. The decades of neglect and almost wanton destruction due to water ingress have taken their toll on the ground floor and anything within. it was clear that we needed to prop a lot of things up during foundation works - and beyond. This shows the north-east corner of the hursting frame after a new lower cross-brace has been fitted. The degradation of the foot of the post is clear - the vacuum cleaner has done a good job! The whole of the east end of the husting frame was unsupported and the mill stones were indeed about to fall into the room below. The oak blocks here will be replaced with engineering bricks and the stump at the lower end of the post will be tidied up properly. At least the collapse has been halted. This shows the top of the repair to the hursting frame. The new piece of oak it let in to the old and jointed into place. a similar job happened below and the two were bolted together as a unit. 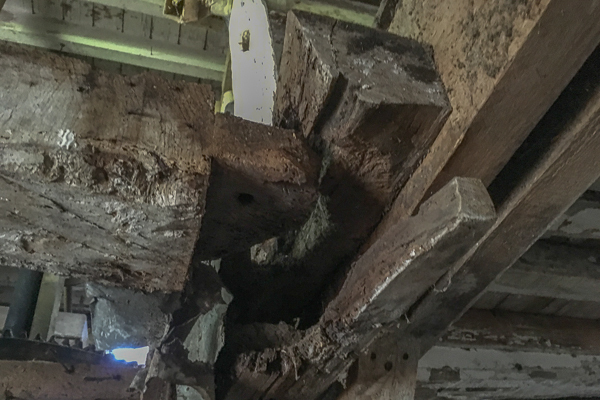 This image shows the view from below of the north east upper hursting frame repair. This joint supports the cross beam under the mill stones which sit directly on top of these two timbers. 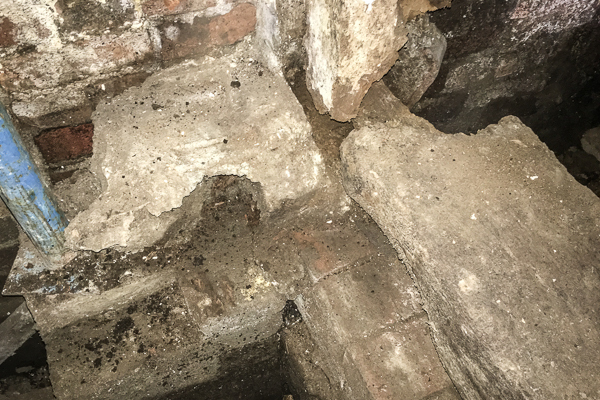 Rot at the bottom of the vertical post caused it to drop and the weight of the millstones rendered the end of the oak beam assunder - this is shown elsewere. 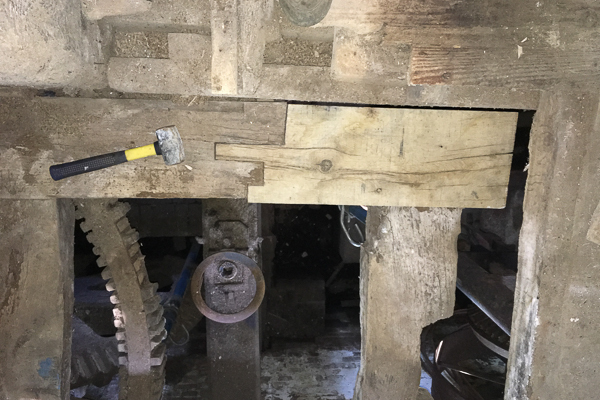 There was no possibility of replacing the whole of the longitudinal member and it was decided to simply graft on another chunk of oak and bolt it to the beam behind it. 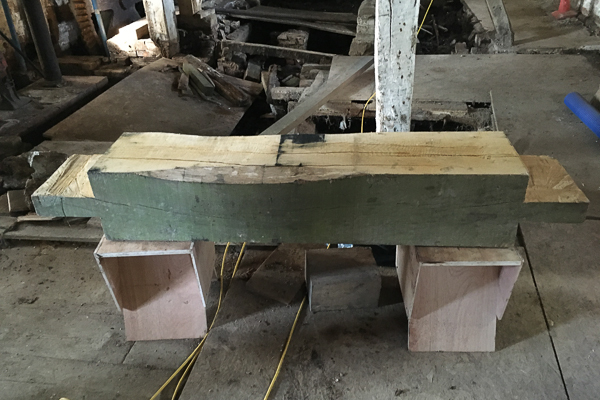 The beam behind also made it impossible to fit a true mortice so this is constructed in two sections split along the length as shown. 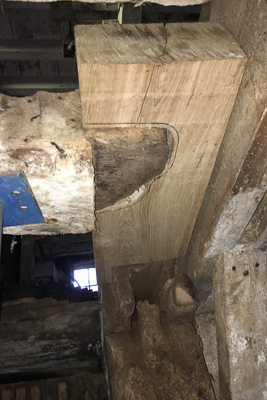 The mortice was routed in the top half of the extension to the longitudinal member and a second chunk of oak was fashioned to fit into the existing joint and mate with the tenon. These two oak sections where then bolted together and the pair then secured to the beam behind with large coach bolts. This image shows the damage to the longitudinal member at the north east top corner of the hursting frame. 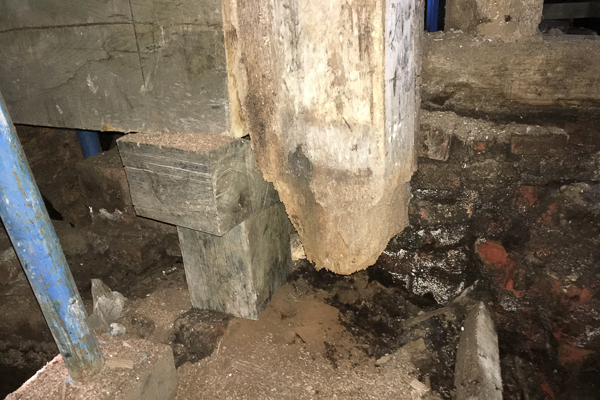 The end of the member has failed as the vertical post supporting it has rotted away.The mortice and tenon joint at the end of the hursting frame horizontal beam simply failed. 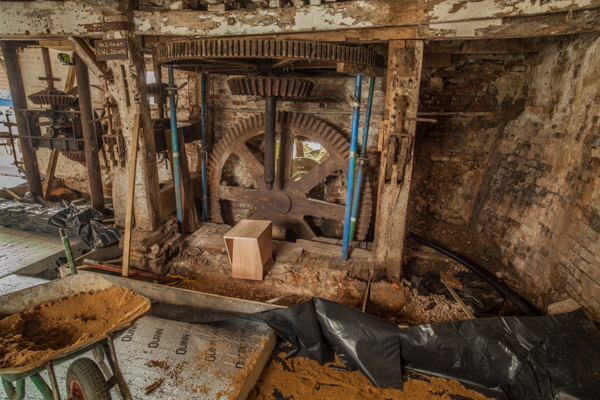 It is surprising that the whole Mill stone assembly didn't collapse into the floor below. Urgent repairs were the order of the day. This shows the East end of the hursting frame back in place with the new lower brace fitted and the laser line showing it to be correctly in plumb. Both posts are now firmly back in their respective places with the mortise and tenon joints back together. There was a time where both posts were hanging in mid air from bits of rope secured from above. It was the only way to get the lower joints together and provided a challenge that precluded a photo shoot. The lower brace is temporarily supported on oak blocks and the missing lower ends of the posts are clearly in evidence. This is all that remained of the lower brace at the east end of the hursting frame. There are no tenons and it's barely recognisable as a beam. The mortices had gone from the posts it was supposed to support. 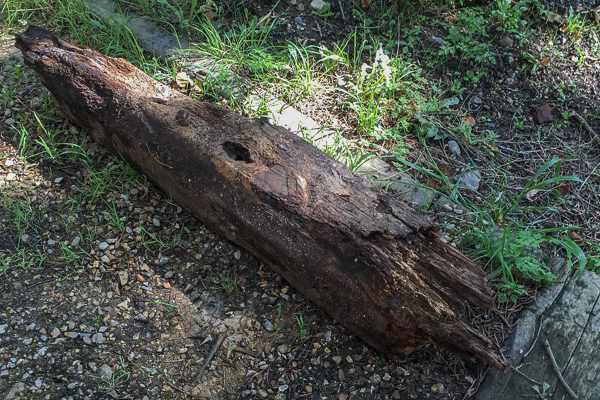 This is a substantial piece of oak. It replaces the the old one which had almost rotted away completely - certainly well beyond the point of usefulness. The tenons are 3"x8" and the section is 12"x15" fitting will be a juggling act with substantial posts to support and gentle nudging into place with a fourteen pounder. 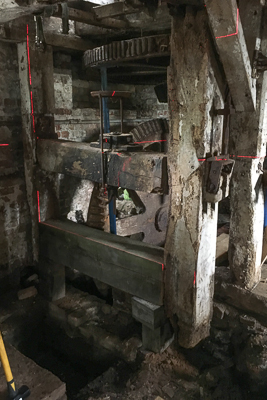 When it's in place it will take the vertical loads that supports the whole of the east end of the hursting frame and the eastern pair of mill-stones. This shows the lower south-east corner of the hursting frame. There is nothing supporting the structure at this corner. And the post has fallen out of its mortice.